As we continue looking at movies that have a case for the number-one spot on any Christmas movie list, we come to one of the oldest and most-viewed of them all: Charlie Brown’s Christmas Special. Why could be be the best? Charles Schultz was a generally depressed fellow with low self-esteem, and it shows in his Peanuts comics and movies. The tone is often depressing or cynical and the Christmas special is no exception. Most of the film is Charlie Brown just trying to have a good day. He gets ignored and made fun of and he fails left and right. When he volunteers to get a Christmas tree, everybody cheers him on, but even then, someone says, “Yeah, do something right for a change!” Thus, he’s not too happy with Christmas. Christmas is a time when many people get cynical. Some bash others for their beliefs or non-beliefs, some just get depressed about their loneliness, some just have one bad snow day after another, some wish they could have snow. 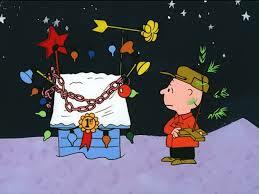 Charlie Brown is one of the most cynical Christmas movies out there, probably second only to Bad Santa. But where as that movie and movies like The Grinch are so over-the-top and cartoony, Charlie Brown is very simple and relatable. 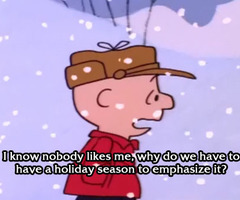 Charlie Brown hits the depressed, angry person in all of us without ever really justifying it. It just is. But it also cheers him up in the end, and generally does for its audience, too. One of the film’s biggest cynicisms is the over-commercialization of Christmas. Ridiculously fake trees, shopping, Christmas plays, ornaments, decoration prizes, everything aggravates Charlie Brown because Christmas doesn’t seem to mean anything but money and materialism anymore. That was in the 60s. How true is it now? Black Friday has spread into Thanksgiving. Christmas itself stretches back through October. Malls are insane this time of year. Christmas knick-knacks line the shelves. Elf on the Shelf has taken the world by storm. Christmas movies are easy cash-ins. Shoot, this very film used to be played every year to get viewership. Even non-Christians agree that Christmas has become too much about stuff and not enough about…well, anything else. For Christians, it’s about Jesus’ birth and what he did. Non-Christians tend to find something like love, family, friendship, or other important things to fall back on. Either way, we all know materialism isn’t the point of Christmas, but it seems to get worse every year. Charlie Brown gets more “amens” every year, so even though it’s from the 60s, it’s never going to get dated. Due to audience concerns, most Christmas movies don’t talk about the Christian stuff. They talk about Christmas being important, but never really go into why. Some try and succeed with general morals. Others are embarrassing in their generic-ness. 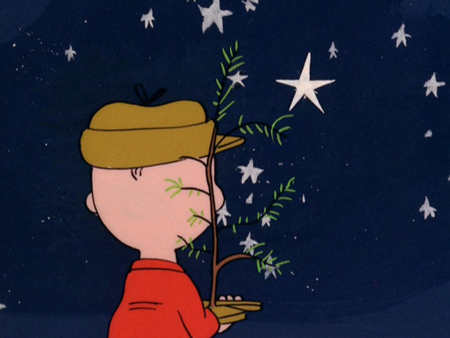 But Charlie Brown, unlike any other famous Christmas special, doesn’t shy away from the true point of Christmas. I know that grates many non-Christians, but truth be told, I don’t care. It’s amazing how few people will say that Christmas is a Christian holiday celebrating the birth of Christ, so it’s wonderful to actually see that in mainstream media. Yes, we get into materialism like everybody else and that’s shameful. Yes, non-Christians celebrate and I’m happy to celebrate with them, even if they don’t believe what I do. But when you ask what Christmas is about, there’s only one answer, whether you believe it or not. And in a world concerned with marketability, I can appreciate one special’s boldness. Everyone and everything from Peanuts gets to shine. Schroeder’s piano, Linus and his blanket, Pigpen’s dirtiness, Snoopy’s goofiness, Sally’s selfishness, Lucy’s short temper, the 5-cent psychiatric advice, everybody being mean to Charlie Brown, and more. This beloved comic strip really gets to shine in this special. In fact, many of the jokes came straight from the comics. Better yet, this special added to the comics by playing in their own mythos. For example, Lucy wants to hear Schroeder play “Jingle Bells,” but Schroeder is way too amazing, so he has to dumb it down for her. That’s a joke you can’t play in the comics because there’s no sound, but that’s the essence of the characters. 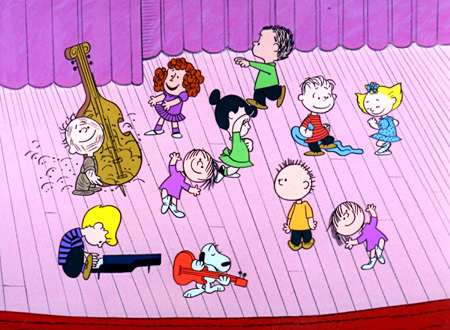 Actually, speaking of sound, this film also made the piano part of Peanuts’ story. The song Linus and Lucy is very famous, but you may also recognize the jazzy rendition O Christmas Tree when Charlie Brown and Linus go shopping. What’s really amazing is that film gets very quiet otherwise. The music plays and the boys just walk. No flare, no gimmicks, just a simple scene. The fun part is that this also represented Peanuts in its finest. It wasn’t as boisterous or as driven by imagination as other comic greats like Calvin and Hobbes or Garfield and the jokes weren’t always obvious or laugh-hysterically funny. The whole comic was simple, subtle, but incredibly relatable and still very funny. It was a wonderful strip and this Christmas special brings that magic to life. In Conclusion…Charles Schultz’ short Christmas special is a masterpiece for its boldness, it’s cynical balance, and it’s ability to bring Peanuts to life. There’s a new Peanuts movie coming out in 2015. In watching the trailer, it looks, eh, okay. But even if it’s great, I highly doubt they’ll be even half as faithful to the source material as the Charlie Brown Christmas special.